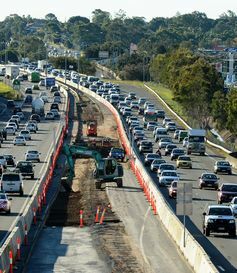 With our “infrastructure prime minister” and both sides of politics trumpeting the building of new roads to reduce congestion, you could forgive everyday Australians for believing that they might have a point. Let’s simply build more roads, then there will be less traffic. Unfortunately, this story reads more like a children’s fairytale than a visionary plan. Many politicians have stood up with the ambition of “solving” road congestion by building a tunnel, highway or bridge. While they may be able to promote the initial time savings as proof of their success, the additional capacity created by this new infrastructure is filled relatively soon. Given constant demand for driving, new infrastructure does initially lead to reduced congestion. In turn, driving travel times are reduced. However, this reduced travel time lures individuals who would normally take other means of transport into driving their vehicles – a phenomenon transport economists refer to as “latent demand”. As more individuals make the switch to cars, road congestion increases again, back to a steady-state point of gridlock – only now with even more vehicles stuck in the queue. This is the harsh reality that our politicians never speak of. A report recently published by Infrastructure Australia forecast that road congestion will cost A$53 billion a year by 2031. Accounting for not only the financial but also the social and environmental impacts of road congestion, we know as a nation we must do something to manage this issue. The benefit of increasing road capacity rarely lasts as an uncongested route attracts more drivers until it is congested again. What we must realise, though, is that road congestion cannot and never will be completely eliminated. Some level of road congestion is actually economically efficient – that is, road space should be efficiently utilised. The only way under our current socioeconomic framework in which we can optimise this level of congestion, and avoid complete gridlock, is through the use of dynamic road pricing. This is otherwise known as congestion charging. Congestion charges have been successfully implemented in cities around the world, including London, Singapore, Milan and Stockholm. Congestion charges have been applied in many different forms, but the principal means is to charge a toll on those who choose to enter and/or exit a congested area during congested periods. Exemptions apply to some vehicles. In some cases, there are even discounts to encourage the uptake of energy-efficient vehicles. In each of the implemented examples, the schemes have been shown to reduce levels of congestion (and, in turn, harmful local pollutants). The charges also raise significant revenue, which governments can then direct back into alternative means of transport and alternative routes. This approach to managing a transport network is in stark contrast to that of most jurisdictions in Australia. Here, we prefer to toll the very infrastructure we want drivers to use to avoid congested city areas – for example, the Clem7 tunnel in Brisbane. None of the revenue raised is used to improve other elements of the transport network, with congested routes allowed to remain toll-free. This discussion becomes even more important in contemporary Australia where we see an unfolding debate between the merits of constructing roads versus rail (public transport). The harsh reality is that every time we drive our vehicles on the road, we use some of its capacity, which has a cost to other drivers and, more broadly, to our society. Yet as individual drivers we do not pay directly to use this space, nor do we receive a price signal to remind us of just what value this space has to society. With the introduction of a road toll, one that varies depending on the time of day driven (as is the case in Stockholm), drivers receive this price signal. In response, they are able to make a more efficient choice about which transport mode to take and/or which route to drive. With variable charging, we are also able to spread the peak traffic periods to provide economic incentives to work earlier or later. But, you say, public transport is already full and it takes a long time. I would rather sit in traffic in the comfort of my car than sit in traffic on a bus. I could not agree with you more. Unfortunately, many cities in Australia are far too reliant on buses, using the same roads as cars and trucks, as a mode of public transport in and out. If Australia is serious about increasing the productivity of our cities to an internationally competitive standard, it must improve the lacklustre quality of public transport. To do this, we need adequate funding. Congestion charges provide an economically efficient manner in which governments can subsidise public transport infrastructure and may even make it possible to construct mass rapid underground rail across our capital regions. Now I am not suggesting we implement congestion taxes across the country tomorrow, but we must have a serious discussion about the future of our transport systems and how we want them to function. With the rise of vehicle-sharing programs and autonomous vehicles, over the next decade we are likely to start to see a fall in vehicle ownership rates. This means governments will no longer be able to rely purely on vehicle registration fees to cover the costs of road infrastructure and maintenance. We must take a serious look at what other options are available. One path forward could be to trial a series of congestion taxes across the country, with a six-month ramp-up period in which public transport services are significantly increased before any tolls are set. We could then gain some insight into just how efficient Australia’s transport networks could be. The decision to make tolls permanent could be taken to voters through a plebiscite. If upheld, governments could then allocate the revenue raised to the construction of mass rapid transit systems across the nation. Despite what our politicians say, simply building another road, tunnel or bridge, while sometimes locally significant, will not solve the nation’s road congestion problems. Jake Whitehead is Postdoctoral Research Associate at Queensland University of Technology.